Inspired by the colours outside. Grey and white pin-stripe custom shirt, grey merino wool sweater (the v-neck is so high that no necktie is necessary), winter white Polo cords. Just because it’s the weekend don’t automatically reach for the same old stuff — there are plenty of guys wearing khakis, polos, jeans and sweatshirts with running shoes. Comfort is a pair of crepe-soled desert boots. Dress down, but tone up! 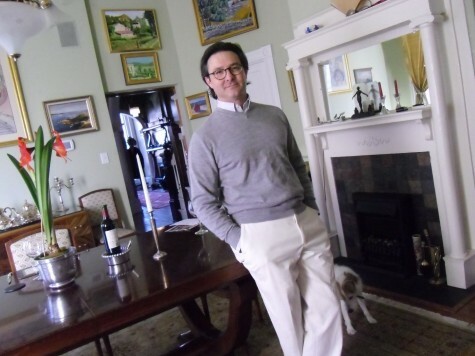 This entry was posted in Elegantology and tagged casual clothing, Desert Boots, Polo, weekend dressing, Winter white. Bookmark the permalink. Well done. I definitely need to invest in some white trousers. Plus, the bottle on the table will do some wonders for the hazy shade of winter, as well. Turling, I had to get used to them (took me a year to actually wear them!) But man, are they comfortable. The bottle on the table is Columbia-Crest two Vines Cab. An excellent value and a good wine. I love clothes in soft, quiet neutrals, especially in soft fabrics such as corduroy and merino wool. Very neat!